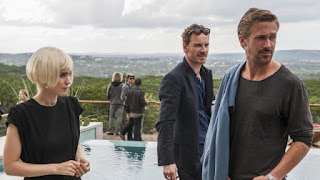 I have never seen modern Terrence Malick films (Tree of Life, To the Wonder, Knight of Cups) but I have heard…let’s say…interesting things about them. I have been curious about watching them but after this I don’t know. I might go back and watch older Malick but this one makes me hesitant to do that. Let’s get reel and break this down. Two intersecting love triangles with obsession and betrayal set against the music scene in Austin, Texas. Um…What did I just watch? The simplicity of the story can be done well but in this case it isn’t. This is nothing more than beautiful people walking around and hooking up with other beautiful people, they get tired of each other, and go hook up with other people. There is no depth or emotional weight to anything happening that I didn’t care about anyone. The connection was lost between the audience and the characters. The “depth” that is added is when Malick makes something deeper and meaningful than it actually is and it doesn’t work as it comes off as pretentious. The characters are unlikeable and don’t really show any range or personality except for a few scenes that felt like they were from a different movie. Some of the dialogue is fine but for the most part is handled through poor V.O. and the actors sound bored with their delivery. Simply put, this film lacks focus. Those few scenes, while unnecessary to the overall plot, I guess were acted well? All the actors and actresses are wasted and they are given nothing to do. I never felt once like I was watching a genuine relationship unfold with fully realized characters. And some of the “minor” characters are just as wasted and pointless as the story. This is where the film doesn’t bomb. I do enjoy the dream-like cloud floating cinematography throughout and it does feel like you are a bystander or a fly-on-the-wall just watching these people and their conversations. It does put you in the moment making the situations grounded so I will give Malick that. The establishing shots are well done and provide a beautiful look of nature and the city environment to show the beauty around the characters and their horrid situations making good visual contrast. This is also a downfall as some of the shots are a bit lazy and have no purpose as to why they are framed or in motion that way. Since the story seems to meander and wander around with no weight or purpose, the two hour runtime feels like a marathon to sit through and it’s very taxing. I have no desire to ever watch this movie again. You might find some deeper philosophical meaning to it but I didn’t and this is a waste of everyone’s time. Out of all the releases this week, please skip this one.